us on buying cold pressed olive oil? A: Oils and fats (butter, olive oil, coconut oil, etc.) is the category of foods which I prioritize as #1 for switching to organic. (See the Organic Food tab for my list.) So I’m always looking for that Organic seal when buying olive oil. However, if you can’t find an organic olive oil which hardens in the fridge, then the certification has been falsified (every system has cheaters I guess), so I would then look for an oil from a small family farm in the US. My reasoning is that family farms tend to make more conscientious choices, and sometimes have organic practices but can’t afford the certifications. Also, you already mentioned “cold pressed olive oil” which is a great thing to point out: the processing of the oil does have an effect on the final product. Cold pressing avoids damaging the unsaturated parts of the oil, which would set it up for rancidity before it makes it to your kitchen. “Extra Virgin Olive Oil” is the first press of the olives; the subsequent presses produce a lower grade of olive oil, with fewer of it’s healthy properties…sometimes called “light olive oil” because it has less of the distinctive olive flavor. There is no difference in caloric value. I only buy cold pressed Extra Virgin Olive Oil. Another thought is that glass is an inert material for the oil bottle…a large jug of oil in plastic isn’t a great idea, even if it’s one of the lesser toxic plastics. Most high quality EVOO that I see today is sold in dark green glass bottles, which can make it difficult to see the color/flavor profile, but which protects it from degradation/rancidity caused by light. Light and heat are what you should strive to protect your oil from as it’s stored. Speaking of flavor profile…this seems to be it’s own art, like wine tasting. My (very!) simplified understanding is that greener means a sharper flavor and golden means a more mellow flavor. What you choose is up to your own palate! The best way to enjoy olive oil is cold, as in salad dressing. I also like to pour it over steamed vegetables like broccoli, and top with Pecorino (a sheep cheese similar to Parmesan). Enjoy! 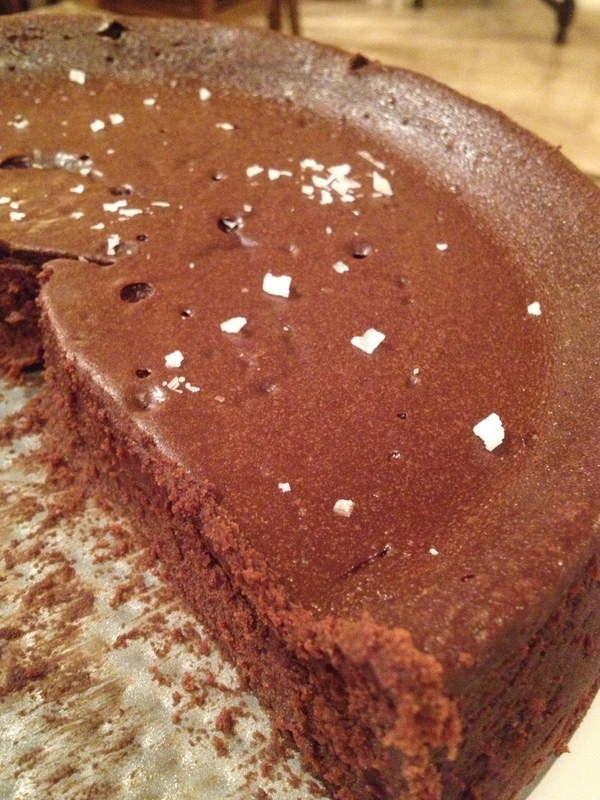 The only two claims this cake has to a health food are that it is gluten free, and it will make you happy. I’m convinced happiness is part of good health. Ten days later, I was hosting another class, this time teaching. Of course I made the same fabulous dessert. Preheat oven to 300 and oil a 10 inch spring form pan. Pour into pan. Bake at 300 for 45 minutes. The center will look wet. Allow to cool some before transferring to the refrigerator overnight. 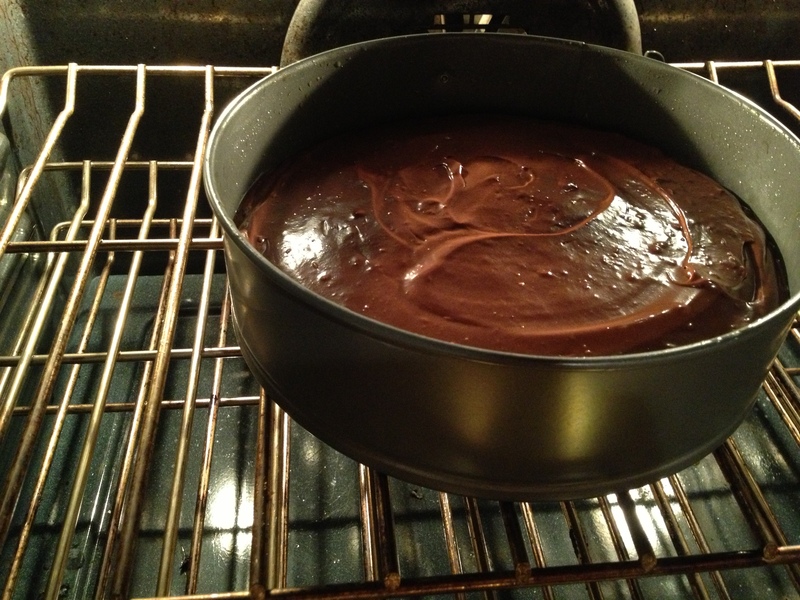 To serve, I just removed the sides of the pan and placed the bottom of the pan on a cake plate. I sprinkle with a lovely flaky finishing salt, and a side of whipped cream with 3 drops of pure peppermint essential oil. Enjoy! I’m the one with Lucky baby that had such a hard time with formula [after a forced wean from breastmilk]. So he’s eating pretty much everything under the sun, except I don’t do any dairy. I tried some goats milk on him and he didn’t really seem to like it so just havent again. I’m confused on how to eat myself let alone make sure I’m giving him what his body needs at 13 months. 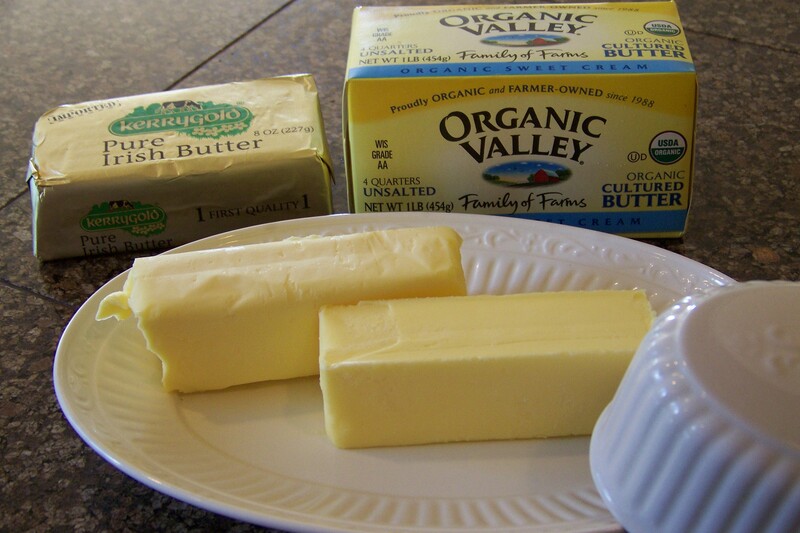 Some sites say low protein high healthy fats, some say paleo for babies is best, etc. So I really like how healthy you and your family are, love following your blog and wondering if you could tell my what type of foods you fed your babies? I don’t know if they should be having coconut pancakes, rice flour, barely those type of grains. 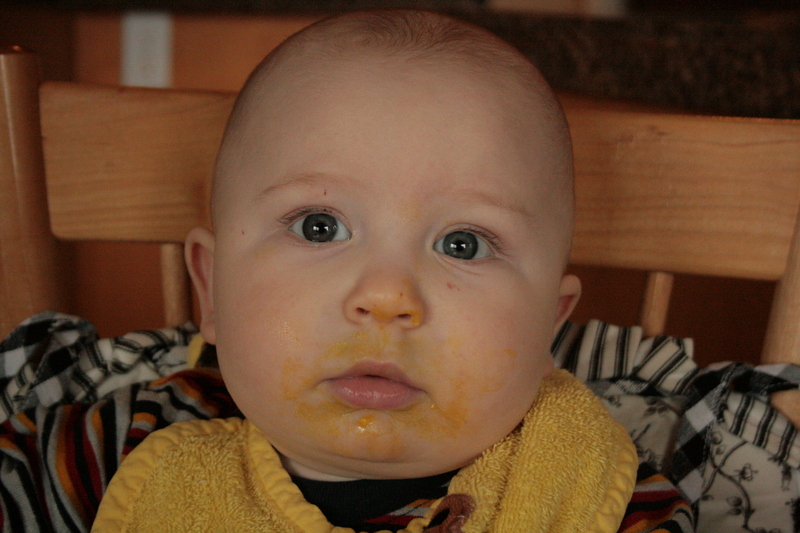 It seems like since I don’t know I feed him a lot of fruit and veggies. Hi friend! It can be confusing with so many opinions out there on diet and nutrition. I think coconut pancakes and fruits and veggies sound great, although you want to make sure he gets enough of the animal proteins/fats too since they are super-foods! 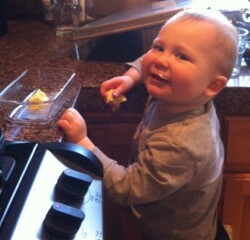 He may disdain goats milk, but if you offered him raw cheese he may just love it! There’s a lot to say on this subject; here are some principles I’ve used as guides for feeding my babies 10 months and up. What’s good for you, is good for baby. If you are pursuing a whole food, nutrient dense diet, then the foods which you haul in from the farmer, cook up in your crockpot, ferment on your counters, or bake in your oven are going to be excellent, nutrient dense choices for your child. I don’t subscribe to the idea that baby food is something to be bought in small containers, have no resemblance to adult food, and be fed to a child at a different time of day than adults eat (although of course this happens occasionally). Someday (soon!) this tiny person will sit at the table with us and eat what we are eating, so why not get them used to the routine and the food while they are still in their high chair? Plus, the idea of cooking two different menus makes me want to cry. I like to wait as long as possible before introducing food at all, and even water unless the weather turns hot. My babies have waited for their first bite of any food until between 8 and 10 months. I look for their cues on hunger/lip smacking/saliva. My last baby, a girl, was quite interested at 8 months, but my largest boy was barely interested at 10 months. Their hunger for food usually arrives about the time their first teeth do. There is some thought that waiting until this time to give foods can reduce allergic responses to food. The first foods I give my babies are: egg yolk from a soft boiled/over easy egg, butter, liver pate (it’s cooked), cod liver oil, banana, avocado, as these are all soft and nutrient dense. After a few weeks of these foods, they are usually ready to try more flavors, so I begin to offer what we are eating. Dinner is our main meal, and there is nearly always something that baby can eat, and often she can eat all of it. I invested in a small baby food grinder years ago, the hand crank kind (portable! ), which can be used to blend up soft foods like spaghetti with meat marinara, roasted chicken and broccoli, anything made in a crockpot, the chunky parts of soup (add back to broth), beans, rice, and most cooked veggies. It only takes a minute, and the child gets to experience those flavors which he has been smelling while dinner was cooking. He’s eating what mom and dad eat. He’s eating it fresh, and not frozen or canned. He’s eating food that tastes good, and if he rejects it on first or fifth try, you can be pretty confident that at some point he will love it like you do. 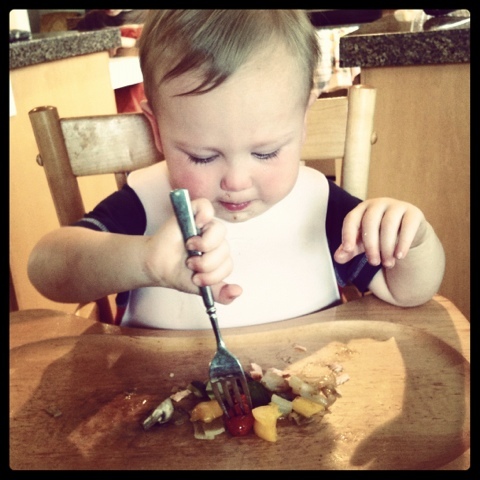 Some foods are hard for a baby to eat: salad, anything really chewy or crunchy. However, these foods are innately difficult to digest as well, so your diet should be filled with lots of other foods he is able to eat. That said, I will sometimes give baby a teeny tiny piece of lettuce with a homemade dressing on it. . . or the cranberry in the salad. . . or a feta crumble. I stick it right in their mouth and wait for the face. These are strong flavors, and I want the baby to experience them, along with some psychological coaching: “yum, yum, yum!” They are shocked, they spit, we all laugh. If we are eating steak, I try to cook it medium rare, and then shave off very small pieces (no need for chewing) and feed them to baby. Yes, steak! My babies have loved this. I have also heard that indigenous mothers chew food for their babies, which begins to break down the foods with mom’s saliva enzymes, before transferring it to baby’s mouth. We love taco salad; baby can eat the ground beef, beans, avocado, sour cream (if no reaction), tomatoes (if no reaction), cilantro, and lime. Soups are messy, but we eat a lot of them in the winter, and if they have a bone broth base it’s awesome nutrition. We have a plastic pocket type bib which really helps contain the mess when spoon feeding baby, or the IKEA toddler smock which is full coverage for when baby feeds herself. Brains, especially growing brains, need fat. Healthy, saturated fats. Besides water, that is what the brain is mostly comprised of, so it only makes sense that babies need a healthy dose of saturated fats daily for the significant growth of their gray matter. 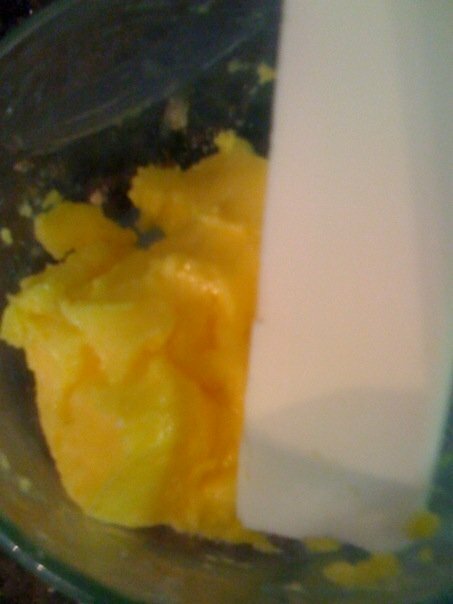 Butter (grassfed/naturally yellow is best), avocado, egg yolk (soft boiled or over easy), coconut oil, nut butters, animal fats found with the meat, liver (organic animals) olive oil (cold pressed and uncooked), and heavy cream with or without the milk (raw from grassfed cows is best) are all great ways to feed baby’s developing brain, and keep baby satisfied for longer between meals (or at night!). Some of these are a meal or snack by themselves: egg yolk, liver, nut butter, avocado, ground meat. Others can be toppings for other foods: butter, coconut oil, olive oil. We all need protein, and carbohydrates, and fats. Babies are no exception. 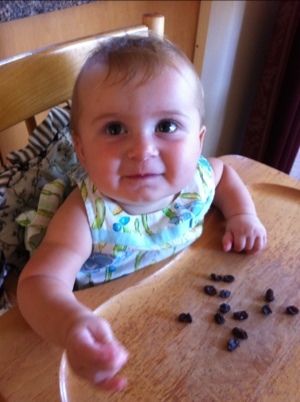 I try to give my baby foods from each food group during a day, with a special emphasis on protein/fat at each meal. I personally feel better when I limit my sugars/starches, so my children’s diet roughly mimics my own, but they do eat more grains and fruits than I do. In the US, toddler fare is universally offered as grain and sweets based. Look at any kids menu and you will see breads, pastas, crackers, fruit cups, sweetened dairy products, and downright candy as the leading act. Most foods marketed to/for kids fall into this category as well. Rather than rant about the lack of protein and fat, and the sugars that push kids toward addiction, set them up for diabetes or worse (OK, I just ranted), I’ll just advise: do not copy this diet in your home. Do you feel better, have more energy and fewer ailments, sleep and perform exercise better, and feel more satisfied on mostly protein, mostly carbs, or somewhere in between? If you have never given this any thought, The Metabolic Typing Diet may help you (gives self-test checklists) to determine this for yourself. And have your spouse take the test too, as your child will likely pattern after one or both of you. Adoptive parents will have to watch carefully for mood/behavior in their baby following different meal ratios. Depending on your metabolic type, you may feel better on more carbohydrates than I do in your diet, and your child is likely to do well with this diet as well. In this case, your healthy diet would contain more whole grain breads and porridge (soaked grains are best), starchy veggies like potato, yam, and corn, and fruits than mine does. But you should still be fighting the “goldfish at every snack” mentality for your child, since these are just not whole foods. Regardless of how much of each food your baby eats, it is difficult to get a child to eat much of anything if they start off a meal with fruits, since those sugars are absorbed into their bloodstream quickly and their hunger signal turns off. It usually works better for me to serve “courses” starting with the protein/fat portion of the meal, and finishing with a few fruit pieces. My husband and I have few allergies, but the few things which I am sensitive to (chicken eggs, cow dairy as a toddler) I have been wary of introducing too early to my children. I am also gluten intolerant, and after two of my children have tested positive as well, we have assumed it is hereditary and have put all our children on a gluten free diet. Since every one is unique, watch for reactions when introducing the “common allergens” and acidic foods like tomato and some fruits. I’ve found that a baby may need to avoid a food, but a few months later they will be able to eat it without reaction. The most common reactions are loose stools and rashes at mouth or bottom. Vomiting, constipation, eczema, or histamine responses (swollen eyes, sneezing, difficulty breathing) are more severe reactions to a food, in which case it may be much longer before a child can handle that food again, if ever. You should contact your child’s doctor with a severe reaction, as follow-up testing may be advised. One largely overlooked component to allergies is imbalance of intestinal flora. Babies usually have flora similar to mom’s, since they acquired their first dose from her in the birth canal and received daily probiotics in her milk. If you question your own gut health, or you/baby have a history of yeast or antibiotics, your baby may need some supplemental probiotics. I have used the Klaire Labs brand of Infant Formula probiotics. Homemade sauerkraut juice or yogurt are other ways to support baby’s intestinal flora. Eating an organic diet is expensive . . . but so is illness. Avoiding unnecessary chemicals on our foods is always a good idea, but even more crucial for the developing bodies of our children. Choose organic and grassfed whenever you find it and can budget it. Here is my prioritized list of foods to source organically, starting with oils and fats, and all animal products. Fruits and veggies are further down the list; you can download a free guide to the “Dirty Dozen” and “Clean Fifteen” on Enviromental Working Group’s site, or download a free app to your smart phone which will allow you to look up produce item by item while at the market. Meal Ideas: These are all foods my babies and toddlers actually eat. 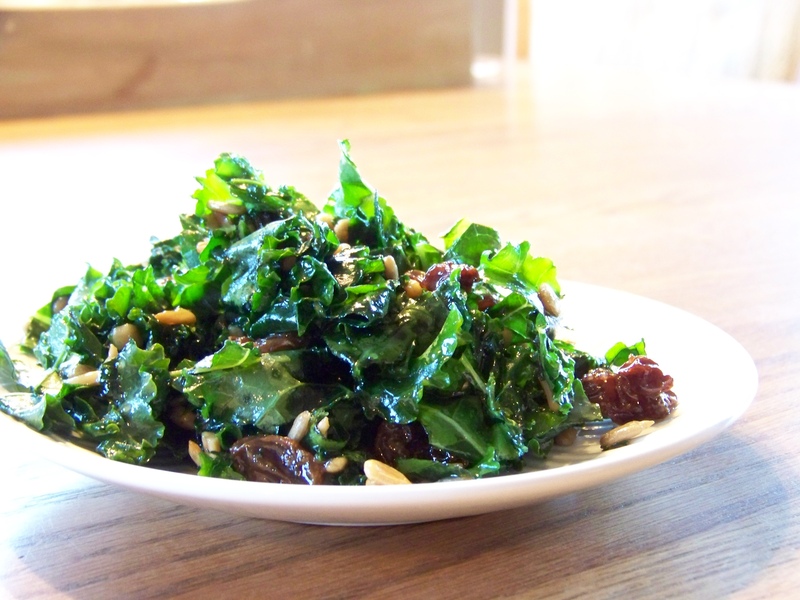 Add a large salad to any of the above, and you’ve answered what to feed yourself for lunch as well. The fruit half of one week’s conventional Bountiful Basket. The idea is that by pooling resources, and with some volunteer labor at the drop-off location, fresh produce can be made more affordable. All the ordering is done online, and -here’s the kicker- can ONLY be done between about noon on Monday and 10pm on Tuesday, Mountain Time. And, if you don’t show up to collect your produce within the 15 minute window, it could be donated (I did forget the first time I ordered, but the lady at the drop was kind enough to call me and Mr. Wonderful dashed out to get it for me. Phew!). So if you order, take some advice from the experienced and set yourself an alarm on your phone for the day it arrives! The whole concept of co-oping is a great idea, and I was pleased to learn that a drop point started in my town in December. Although I hadn’t ordered that week, I ran down to the drop point on Saturday morning and snapped a few pictures of what was being handed out to those that had contributed. 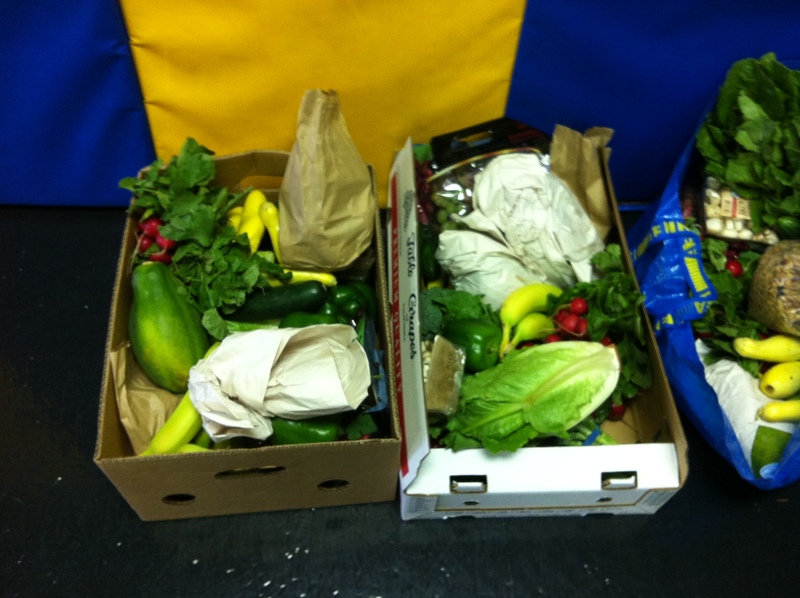 Each participant gets a basket (literally a plastic laundry basket) with fruit, and one with veggies. 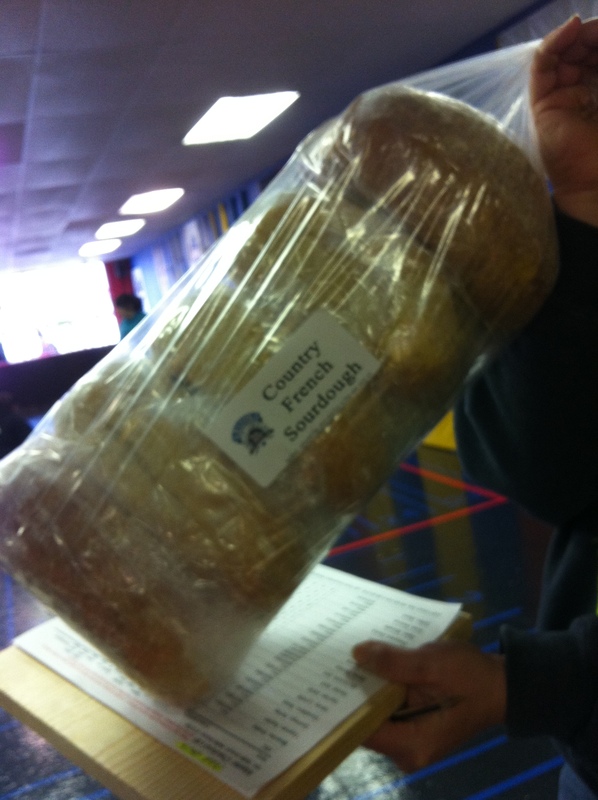 They then transfer those to their own bags, or some of the boxes for recycling, and take home the goodies. 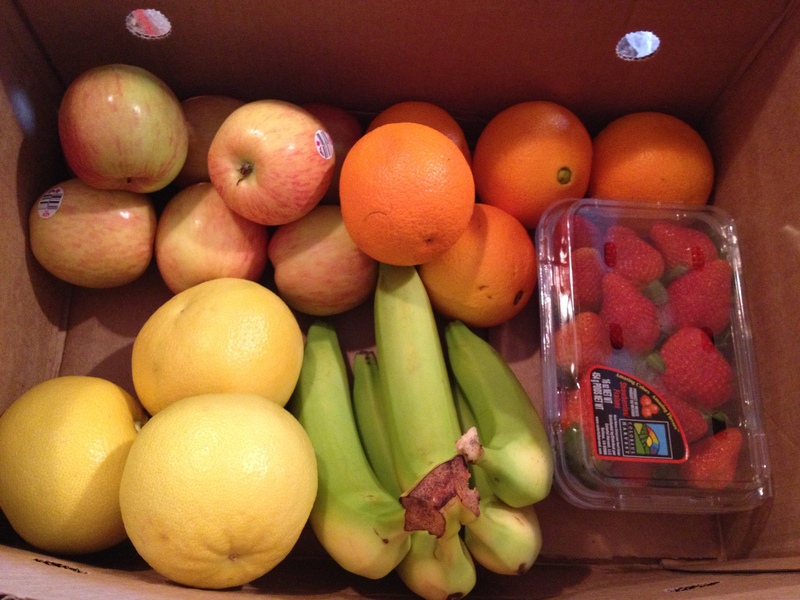 Above is a picture of two boxes…I’m thinking that each must be one share (having both fruit and veggies) from that day. 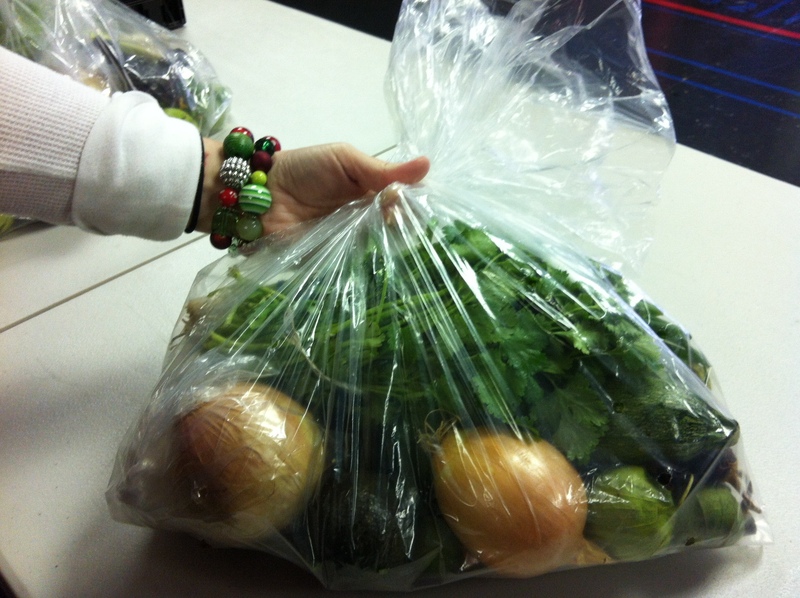 The conventional produce basket is $15 and upgrading it to organic puts your contribution at $25. And “hoping” is part of this commitment. There aren’t any promises of what you will get. You just find out what comes when you get it. This might be frustrating for some; for others it adds some excitement to meal planning. Here’s a picture of the bread pack add-on. These packs of 5 loaves are generally $10; a great deal if this was on your list anyway. 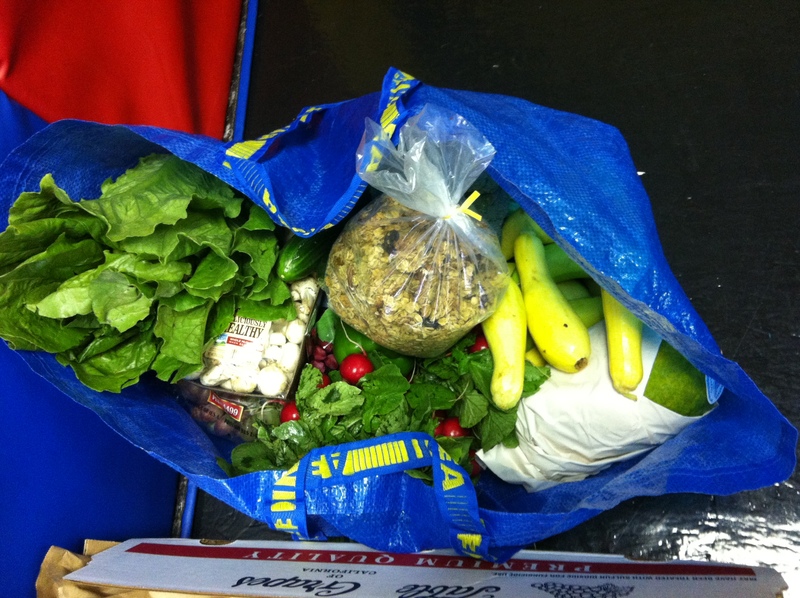 Here again is someone’s produce basket contents (fruits and veggies in there) with a Granola Pack. I believe I saw the granola listed for $10, with excellent ingredients if granola is part of your diet. Most of the produce seems to be standard family fare; persimmons or multicolored carrots is about the extent of the exotic produce. So…the week after I checked out the goods, I made my first order. 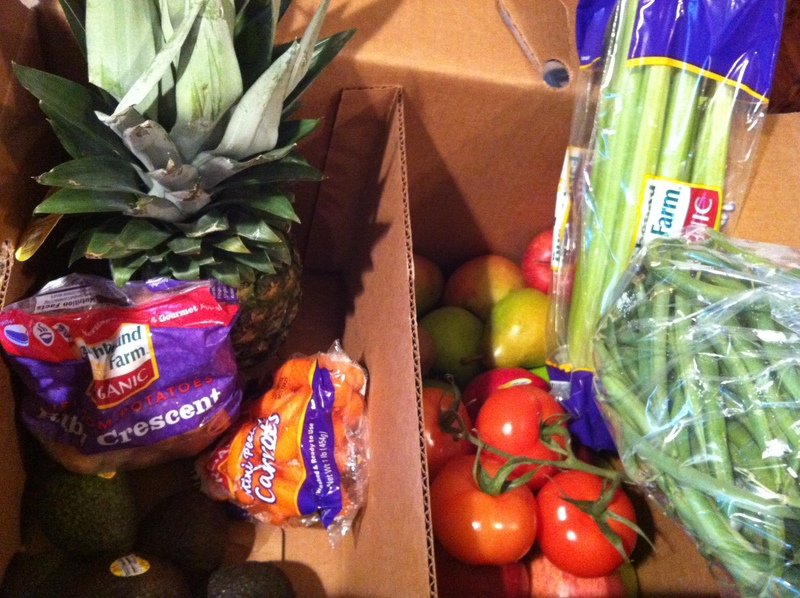 Pineapple, baby carrots, red potatoes, celery, tomatoes, green beans, avocados, pears, 2 kinds of apples. It was late December, so you can hardly blame them that the tomatoes weren’t ripe. The avocados were on the small side, but most of the organic ones I’ve seen are. The pineapple took a couple weeks to ripen. The apples and pears were all delicious, if on the small side. 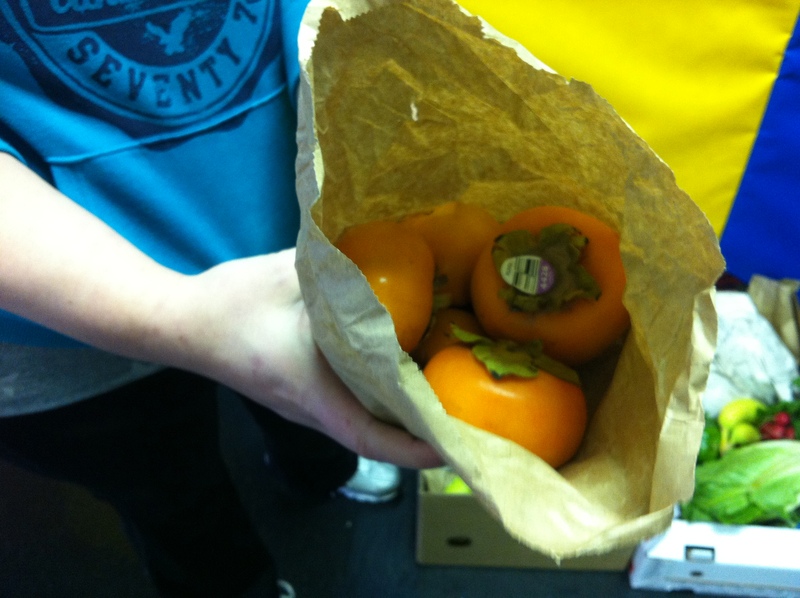 You can see by the packaging on the produce that they came from national organic brands. 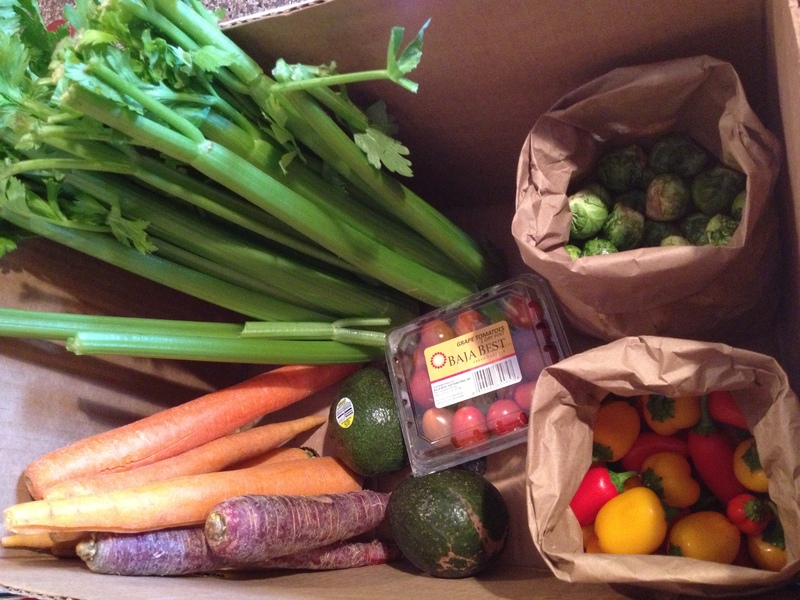 Also, since this was the “organic box” vs. a conventional produce basket, it came shipped as a box. It was not divided out with the other produce, but shipped from Arizona as a whole box. I think it was a good price for what you get. Not amazing: local sales on all these products could give better savings, but you’re unlikely to get them all on sale in the same week. I felt that the food was in good condition, and all delicious, or would become delicious with ripening. Veggie half of the basket. Fruit half of the basket. Celery, multi-colored carrots, brusselsprouts, sweet peppers, avocados, tomatoes, grapefruit, bananas (small), oranges, apples, strawberries. A very good deal for $15. 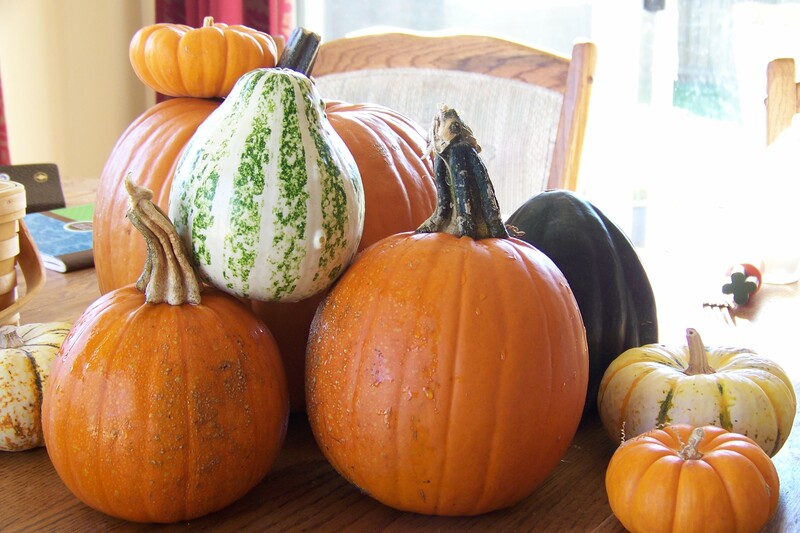 They were all in good condition upon arrival, except for the brusselsprouts which seemed to have encountered frost as the edges were slimy as if frozen. I had heard tales that the delivery truck encountered snow and barely got through, so chalk it up to that? The strawberries were not ripe, and after leaving them on the counter for a day, we ate them anyway, since they were going to mold soon. Strawberries aren’t a winter fruit. In general, I try to eat what is in season. It tastes better, it’s more likely to be grown in the US (avoiding the fumigation upon arrival in the US), and I’m more likely to find organic foods at reasonable prices. Of the foods above in the conventional basket, I regularly buy avocados, brusselsprouts, bananas, oranges, and grapefruit conventional, because they have less pesticide residues. All the rest I only buy organic, as they are heavily sprayed and/or retain their pesticides after washing. You can download a free guide to the “Dirty Dozen” and “Clean Fifteen” on Enviromental Working Group’s site, or download a free app to your smart phone which will allow you to look up produce item by item while at the market. You buy conventional produce anyway, or if you would like to buy organic produce, but you don’t have any health food stores near you that carry it. You don’t have picky eaters of specific veggie/fruit allergies in your family. You can remember to order and pickup at certain times each week. You aren’t gluten intolerant, so you can take advantage of all the great deals on bread, etc. which gives you more value for the time you spend ordering and picking up. You have time to volunteer occasionally an hour before pick up time. You enjoy the challenge of working a broad selection of produce into your weekly meals. You want to buy mainly local, in season, or small-footprint organic. You have fruit or veggie intolerances so you’re not able to eat some of what comes each week. You cook “month at a time” style, or in other ways which require certain specific ingredients. When making a clean green start in your diet, the most important place to start (in regards to your health) is with the oils/fats you consume. When thinking of oils and fats, remember that most prepared and processed foods have some type of fat in them. Read labels so that you can avoid toxic fats such as hydrogenated oils and vegetables oils heated to high temperatures. Even at cool temperatures, long shelf lives of some prepared foods mean that good fats have gone rancid before you open the box. When buying oils, look for glass containers, as plastic leaches into oils/fats at a much higher rate than even into water based foods. Colored glass is best, as light will cause oils to become rancid as well as heat. Trader Joes has an excellent price on quality/organic butter, and a good price on organic olive oil. I have found the best price on organic olive oil at the Grocery Outlet, although it can be hit and miss. Tropical Traditions is an excellent source for organic coconut and palm oils, with the best price being a large order to split with friends. In the the Portland are, the Alberta Co-Op is a good place for this quality and price on coconut oil. 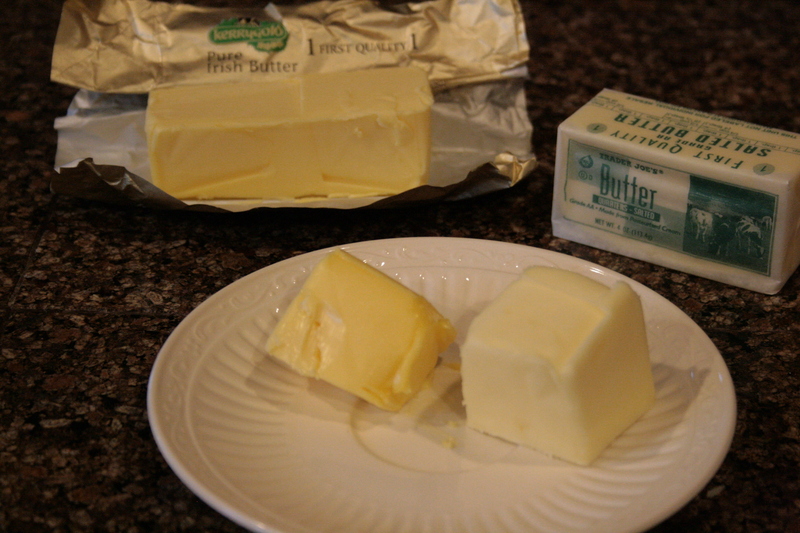 In recent years, the vegetable oil lobbys have “framed” butter and other natural saturated fats as unhealthy. Don’t believe the propaganda…it is for their profits, not your health. You can get the real story at the Weston A Price foundation. Bulk up your diet with veggies; organic or conventional veggies which are low on the pesticide list (see my Consumer Wallet Guides). Veggies, whether cooked or raw/salads, are naturally cheap fillers, and good for you! Buy in season when available (super cheap from local farmers/big gardeners), and frozen when not in season. Stop buying expensive, unhealthy snacks, deserts, and sodas, and instead choose smaller portion snacks of organic or natural yogurt, nuts, fruit, homemade muffins. When your grocery cart is a quarter full of crackers, chips, cookies, ice cream, and sweet drinks, you can bet about 1/3-1/2 of your grocery budget is going to these items, which aren’t even part of your meals! Choose filtered water with lemon or lime over sweet drinks, and then “treat” yourself occasionally to an Italian Soda made from Mineral Water and a 100% juice from a trusted brand (like Knudsons). 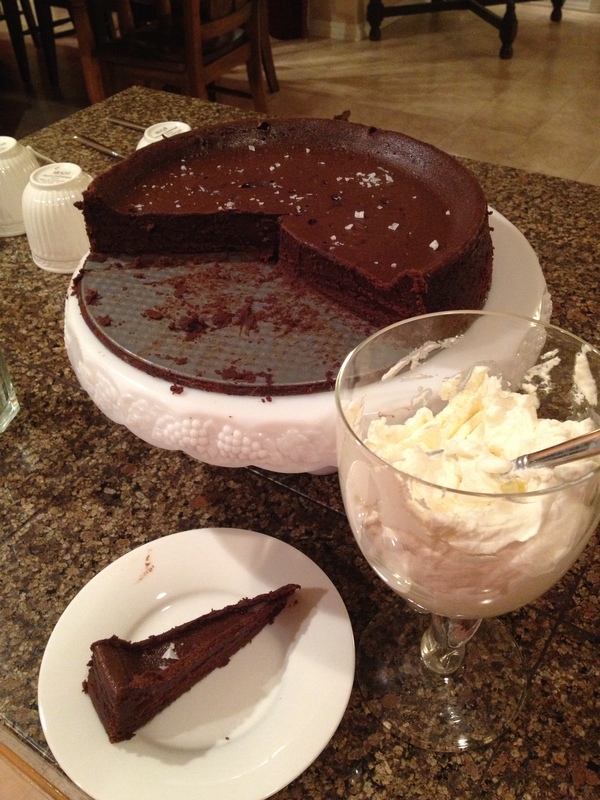 Keep deserts for special times, like birthdays, and then make or get something REALLY good from the best ingredients. With the grocery money freed up by eating more veggies and buying less snacks, deserts, and drinks, invest in better meat and dairy products. Grassfed meats are best, and it is possible to buy a half or quarter beef, lamb, or hog for your freezer directly from a farmer for a great price per pound. If you can’t buy grassfed, look for free range chickens, and organic or natural beef at Trader Joes which has good prices. Always buy seafood wild caught; watch for sales.As far as dairy: always buy rBST free, and try to find grassfed or organic. Many artisan cheeses, some from Europe, are superior even to organic US dairy in that they are grassfed. Again, the Trader Joes prices are amazing for both cheeses and milk/cream/butter/sour cream, etc. One good option, if you have the ability, is to buy good milk/cream and culture your own yogurt/kefir/sour cream. Since we are a big smoothie family, we save about $15 each week because I culture 2 gallons of milk into kefir and yogurt, rather than buying those products ready made. The best diet for most people is heavy in veggies, meats, fruits, with some dairy and nuts (if you have no allergies to those foods). Grains and legumes can be good additions/fillers if they are properly prepared, however, most Westerners have far too much of these bulking complex carbs in our diets, and our waistlines are proof. However, they can be good fillers if you find you are too hungry without them. If you buy them in bulk (dry) and prepare them from scratch at home they should be super cheap even when organic. Buy directly from a farm or grow your own. This is often cheaper, and you’ll know where (and who) your food comes from. 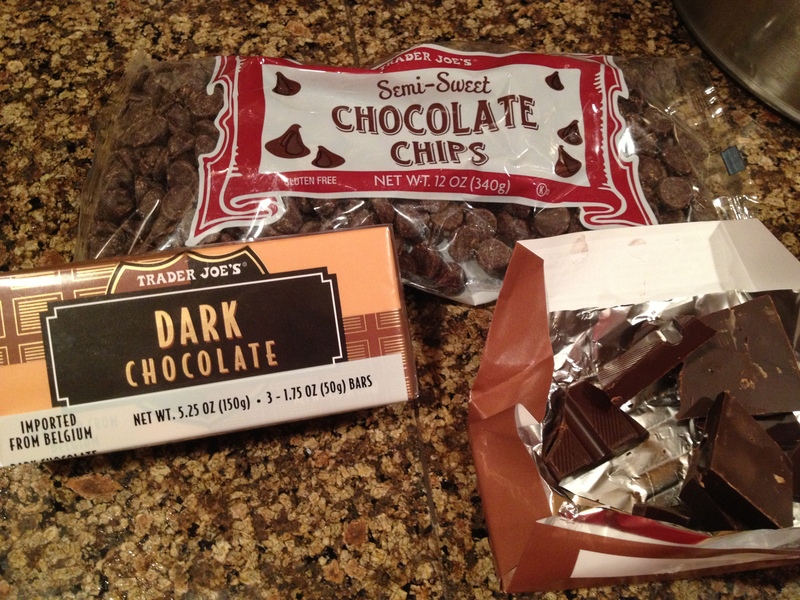 Shop at Trader Joes: they often have the best prices around. Compare prices on the internet (research sources), and with Co-Op buying. Check out Grocery Outlet for clearance prices on natural dairy, organic olive oil and some other shelf items, as well as personal care products (always read lables!!). Conventional stores (Safeway and Fred Meyer in my area) often have organic items on clearance in the bins near the back of the store/warehouse door, and clearance stickers on refrigerated items in the cold cases (near to expiration date items should be used immediately or frozen). Pair with a coupon for a great deal (see below). It’s hot dog season, so I was thrilled to find the delicious Applegate Farms Uncured Organic Grassfed Hot Dogs at my local Trader Joes for the great price of $4.99. Sign up for their newsletter, and then you can print off the coupon for $1 off 2 packages of hot dogs, making it $4.49 apiece when you buy two. The ingredients are: organic grass-fed beef, water, sea salt, celery powder, organic onion powder, organic spices, organic paprika. Now let’s take a look at some specific cleanses. These are all cleanses I have tried, or a close family member has tried, so what I share is just my personal opinion and experience, is not medical advice, and should in no way replace the recommendation of your trusted physician. Vegetable juicing: using a juicing appliance to extract the juice from vegetables and fruits. A great deal of vegetable nutrients can be consumed in a small amount of juice, however the tendency to use sweet veggies and fruits (i.e. carrots and apples) can cause blood sugar spikes and crashes and exacerbate candida overgrowth. Raw Vegetables: mainly a raw vegetable cleanse, can include raw juices. Some people eat “raw” as a lifestyle, and often include nuts and raw dairy, which are often avoided for a cleanse. The idea is to benefit from the live enzymes in the raw veggies, which help to break them down. However, raw vegetables can still be difficult to digest in persons without sufficient supply of enzymes for breaking down fiber and other plant carbohydrates. Vegetable soup cleanses: another variation on vegetable cleanses. More vegetables can be consumed than in a raw cleanse, but enzymes are destroyed in cooking. More fiber than a juice cleanse. Grape cleanse: when only grapes and water are eaten. The high sugar content may exacerbate candida or other fungal overgrowth. Seneca Indian 4 day cleanse: a combination of all the above: day 1 raw fruit only but no bananas, day 2 herbal teas with maple syrup only, day 3 vegetables of all kinds: juice, raw or in soup, day 4 rich vegetable broth only. Unless you are using organic vegetables, you can forget it as a detox. Other than the detox properties of the cleanse (with organic only), vegetable cleanses seem to focus cleansing on the colon. Since this organ stores and then moves waste out of the body, it would seem a logical organ needing a periodic cleaning. A few days to a week has been more than sufficient in my experience, however every body is different. Note that “cleaning out the colon” does not mean that flora imbalances are corrected: if you have overgrowth of Candida (fungal) or harmful bacteria, this kind of cleanse will not correct that (you will likely need a combination of herbal and/or pharmaceutical medicines and probiotic supplements supervised by a doctor, with follow-up testing to confirm efficacy). Vegetable cleanses are excellent for breaking food cravings. Cleansing and/or detoxing while pregnant and breastfeeding is not recommended, since toxins will be mobilized and could harm a baby in the womb or at the breast. This can be very frustrating for women in the middle of childbearing years, especially when they plan to nurse beyond a year with each baby, and find breastfeeding and pregnancies come back to back. I have been told by a Midwife whom I trust that the only “cleansing diet” she recommends to her moms is a raw vegetable/salads with lemon diet for one week while nursing (not pregnant). However, this should only be done after the milk supply is well established (perhaps after 6 mo. postpartum of full-time nursing). I did try this with my first baby, but had a hard time feeling satiated/getting enough calories, so I gave it up after 2 days. There is no doubt: vegetables are good for us. However, I do not advocate vegan or vegetarian diets as healthy: they just haven’t held up to science or to my own experience. And don’t think that only vegetables help us detox; meat protein contains many amino acids not found in veggies . . . amino acids which detox certain kinds of chemicals accumulated or manufactured in our bodies. So (as I state in the intro post on this topic) the best cleanse is a long-term clean balanced diet. Up next: some fasts and more specific cleanses.